As many as 25 000 DJI drones have been sold in South Africa. Remotely-piloted aircraft systems, or drones, have steadily increased in popularity in South Africa since regulation was passed in 2015. While once considered an expensive hobbyist pursuit, the industrial applications for these flying machines are now being firmly established, with government also spotting the advantages of putting drones to work. The brand that is most often associated with drones is DJI, a Chinese start-up that dominates the global drone consumer market with roughly 70% market share. According to Ro'an Rossouw, CEO of Navworld (which has been bringing DJI drones into SA since mid-last year), 20 000 to 25 000 DJI drones have been sold since they were first introduced to the country by various distributors. Comparatively, there are around 600 registered commercial drones with just over 30 active remote operating certificates (ROCs). The ROC is a certification issued by the South African Civil Aviation Authority (SACAA) and is compulsory for operating a legal drone business in SA. In February last year, it was reported that 465 drones had been registered, more than double that of the previous year. Drones are categorised as aircraft worldwide and are therefore integrated into the existing manned aviation sector and civil airspace. Until July 2015, there were no laws in place in SA, which meant the flying of any unmanned aircraft was illegal. New, stringent regulations were set up in response to the growing demand to regulate the sector so SA could take full advantage of the emerging technology. These rules covered where the drones can fly and how far away they are allowed to be from the operator. All drone users need to follow these rules, yet only pilots using the drones for commercial use need to apply for a licence. There are hefty fines for failure to abide by the rules, including a 10-year prison sentence or a fine of R50 000, or both. However, this has not dampened people's enthusiasm for the flying vehicles. Rossouw says when comparing the market between enterprise and consumer-level drones, more than 90% of drone sales are to consumers. Spencer Chen, MD of Rectron, one of the other DJI distributors in SA, says the company has seen a good response from buyers for drone products that Rectron started bringing in at the beginning of this year. He says DJI products are currently aimed at hobbyists and consumers, but when he visited the DJI factory in Shenzhen, China, he saw DJI was also working on drones for industrial applications, such as farm irrigation. He predicts the popularity of drones will continue to rise and we will see increasingly more business use cases. Meanwhile, Cape-based UAV Industries says it is the first firm in Africa to offer SACAA-accredited beyond visual line of sight (BVLOS) training for drone pilots. With this training, drone operators will not have to actually see the drone to use it. The applications for this type of usage include long-distance inspection of critical pipelines and powerlines, rapid response for emergencies, and high altitude assessment. The 10-day course will be open to all drone pilots in possession of a valid remote pilot licence and will be offered at the UAV Industries Flight Schools in Cape Town and Johannesburg. "UAV Industries has been working hand-in-hand with the SACAA for the last two years to get BVLOS endorsement standards and course contents finalised," says Ken Venn, head of training at UAV Industries. "With no African BVLOS precedent to follow, this has not been an easy process, but we are delighted that together we have successfully developed a blueprint for global BVLOS training and operations for the future." Current visual line of sight (VLOS) drone regulations limit operations to a radius of 500m of the drone operator and a maximum upward distance of 120m. An accredited BVLOS pilot with the correct equipment is able to undertake much longer distances and wider areas. "BVLOS is a game-changer for the drone industry and brings about significant opportunity for expansion. It will make long-range missions and data-gathering operations more cost-effective, meaning companies that previously found VLOS limits uneconomical, can now revisit their aerial requirements and use BVLOS to improve efficiency," says Venn. The industrial applications of drones have not escaped local government. 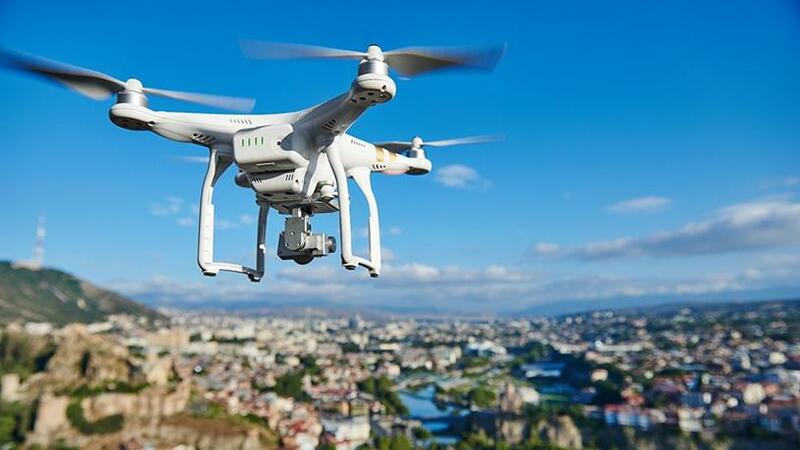 Gauteng infrastructure development MEC Jacob Mamabolo said this week that drones will be used to monitor progress at the province's various sites of construction over the next three years. He unveiled the province's multibillion-rand project portfolio, which includes 340 projects valued at about R4.5 billion, with R1.7 billion being allocated for the 2018/19 financial year.